The fall season in New Hampshire varies a bit, but generally takes place from mid-September to mid-October. The state has 14 officially designated scenic drives covering over 900 miles. Suggested activities include canoeing in the Connecticut River Valley, biking on the Sugar River Recreational Trail, driving through towns like Bath, Columbia, Cornish, Langdon and Newport and hiking the Appalachian Trail. Drive across one of the state's more than 50 covered bridges, soar high above the multicolored trees in one of the ski resorts' gondolas and enjoy assorted fall activities such as agricultural fairs, antiquing, and llama trekking. Vermont enjoys a relatively long fall foliage season, typically beginning in early September and ending in late October. 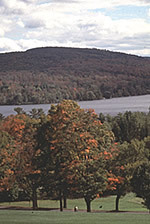 Color changes start in the higher elevations of northern Vermont and travel through the state to the lower elevations. Practice your swing on some of New England's most scenic golf courses, or on one of many tennis courts. Take a guided horseback ride, fish in local lakes and streams and pick up some of the maple products that make the state famous. Some of the top fall festivals and events in Vermont will enhance your visit, such as the Plymouth Cheese & Harvest Festival in September, the Shelbourne Fine Wine & Food Festival in September, the Underhill Annual Old fashioned Harvest Festival in September, and the Annual Vermont Sheep & Wool Festival in Essex Junction in October. When fall colors blanket the landscape in this Midwest state there are many opportunities to enjoy the changing scenery. Drive along the state's Upper Peninsula on Brockway Mountain Drive or visit one of the largest waterfalls west of the Mississippi, Tahquamenon Falls. In Michigan's Lower Peninsula, hike up the dunes at Sleeping Bear Dunes National Lakeshore for a terrific view of Lake Michigan. During fall, pick fresh fruits and vegetables from farmers' markets, roadside stands and U-Pick farms throughout the state. Drive a jeep through the Huron-Manistee National Forest on one of Sandy Korners Fall Color Tours, soar above the trees on a yellow open-top biplane of Skydance Air Tours or hike through Holland State Park — one of the most popular parks in Michigan. From mid-September to mid-October, Wisconsin offers visitors prime fall color viewing with a variety of activities to highlight the best of the season. Fall drives along routes such as the Lake Michigan shoreline, Kettle Moraine State Forest and Great River Road showcase the enhanced beauty of the landscape. Resort destinations including Door County, Cedarburg, Bayfield, Prairie du Chien and Lake Geneva offer romantic autumn retreats. Families will enjoy finding their way through local corn mazes, haunted houses and local fall festivals such as Laura Ingalls Wilder Days in Pepin (Sept. 21 - 22), Octoberfest in Appleton on September 28, the Bayfield Apple Festival (Oct. 4 - 6), Zoo Boo in Green Bay (Oct. 18 - 19 and 25 - 26) and Autumn Harvest Fest in the Wisconsin Dells (Oct. 19 - 20). People travel from all over the globe to witness fall colors. It's not uncommon for inns and hotels to fill up as much as a year in advance. But, even during "peak" foliage season, there are always rooms in Vermont. To help you find them, check our lodging availability map which is linked directly to our online Travel Planner. Experienced foliage visitors come midweek when weekend crowds are long gone. For other insider "secrets," read our Fall Travel Tips section. There is no magical moment when the leaves reach their most vibrant. Peak is a continuum and every season it moves differently depending on weather patterns, soil conditions and the health of the forests. Location plays a big part. Not only will you avoid the bigger crowds found in resort areas, you'll enjoy some breathtaking drives. While we're on the subject of driving, be sure to check out our recommended Scenic Drives. The best views are easy to find — if you know where to look. A great source for local information is the county forest ranger. They watch the colors for foliage updates. Stop in at the county headquarters and they'll be more than eager to share their favorite viewpoint.